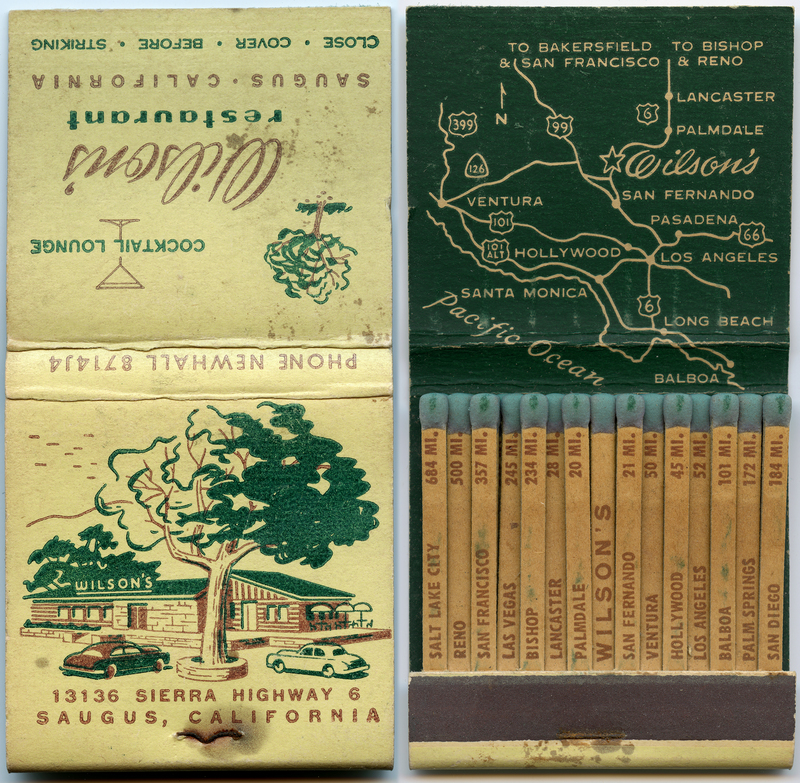 Front strike printed stick matchbook, Wilson's Restaurant, 13136 Sierra Highway 6, Saugus, phone Newhall 8714J4. The restauraunt was a popular roadside stop in the 1950s. Los Angeles County Assessor records show a 1951 construction date for the 4,744-square-foot building. It's located in the community of Sleepy Valley, which today (2014) is considered part of Agua Dulce. Before the road was called Sierra Highway, it was known as U.S. Highway 6. "Sierra Highway 6" might indicate a transitional period between the two names. Salt Lake City — 684 mi. San Francisco — 357 mi. Las Vegas — 245 mi. San Fernando — 21 mi. Los Angeles — 52 mi. Palm Springs — 172 mi. San Diego — 184 mi. Today (2014) the building is home to the Holy Alamo Christian Foundation. LW2651: 19200 dpi jpeg from original matchbook purchased 2014 by Leon Worden.